Stonedozer - Dr. Dre has it, do you? Since I don't have a "good" version of "The Living Room Sessions" that I can put up on Bandcamp (yet) I figured I'd fast forward chronologically and talk a little about "Stonedozer". As I mentioned during my "Fancy Fancy" post Jay had moved to New York and Brian Peet and I were recording together. With Brian's help I upgraded my studio set up to an E-MU Darwin (a digital 8-track) and a PC that allowed me to use virtual MIDI tracks which expanded the possibilities of over 8 tracks. 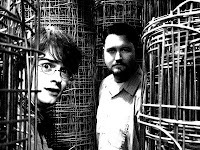 I recorded mopehead tracks and my first Pumpkinland hauntscape during that time. In 1999 Jay returned with his wife to the Bay Area. I had recently become a stay-at-home Dad and since Jay moved nearby we decided it was time to start a new Rain Station project. My folks would watch my daughter at least once a week (sometimes more) and Jay would come over to record. With the new gear it was evident that we were going to end up with a pretty good recording. In some cases I recorded after hours - drum programming, bass, guitar and keyboard tracks. In the case of "It Doesn't Show" Jay laid down a guitar track and I recorded instruments around it. Jay and I also talked a lot about keyboard sounds and many of the keyboard tracks were done when we were together. I wrote lyrics for some of the songs and others Jay would come over and write lyrics to. Vocally we'd record once songs got closer to being completed. On some of the tracks we brought in other vocalists - his wife, my sister and a friend of mine named Idia Huntley who worked with me at the good guys. We also brought in Jay's friend Joe to play the guitar solo for "City Girl". We mixed the project down and scheduled a date to master it. We mastered "Stonedozer" at Fantasy Studios with George Horn. George mastered The Screaming Paisleys "EXIT" LP so it had been some time since I had seen him. His ears are incredible and mastering with him is a joy. What was nice was that he kept asking about my equipment and process. He was amazed that we had done the whole project on a digital 8-track. We talked mics and such and he was generally impressed. It made me feel like the years of recording college (and recording) had paid off. We sent the master of for replication and waited. 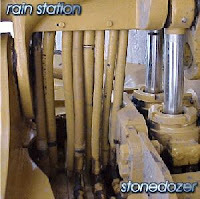 On 4/20/2000 Rain Station released "Stonedozer". We sent out tons of press kits to radio (college, mainstream and alternative), websites (for review) and to print publications. The CD was received well and gained some airplay, but failed to conquer the world as we had intended it to. A couple months later I heard a story from Jay about his brother and our CD. Jay's brother worked for a high end pro audio company in Indianapolis. During the Up In Smoke Tour (formerly called the Chronic 2000 Tour) Jay's brother was working on the stereo system on Dr. Dre's tour bus. To "test" the system his brother dropped "Stonedozer" into the CD player. As Dr. Dre, Snoop Dogg, Warren G, Ice Cube, Nate Dogg, Eminem, Xzibit and more (possibly) listened on, his brother continued to tweak the system. Dr. Dre asked him, "Who is this" and his brother answered, "My brother's band, Rain Station". Dr. Dre said he wanted the CD and said, "If this is your brother you can get another copy of it". So, on June 30th, 2000 Rain Station's "Stonedozer" became a part of the CD collection on Dr. Dre's tour bus. Here's a chance to listen to the disc in its entirety via Bandcamp. Jay likes to listen to the CD starting at track #3. "Rise" and "Stonedozer" are a bit of an abrupt way to start a CD so perhaps heed Jay's advice, start at track 3 and then come back for tracks 1 and 2.